Following a visit to RAMM in early 2013 I received a list of specimens that may have arrived at the museum from zoological gardens in the UK. This included two specimens of the Little Swan Island hutia (Geocapromys thoracatus). Primley Zoo (now known as Paignton Zoo Environmental Park) donated them to RAMM in 1939/40. 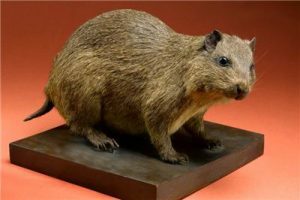 The Little Swan Island hutia became extinct in the 1950s due to the introduction of non-native predators such as cats and a particularly strong hurricane in 1955. Just 29 specimens of this species were known to exist in museums. 17 are in the USA and 12 at the Natural History Museum, London. Records did not include the two at RAMM. On a subsequent visit to the Museum in June 2013 I was able to examine the listed specimens and to confirm that they were, indeed, G. thoracatus. Both specimens are in excellent condition and conform in every way with the descriptions of the species given in Morgan (1989). These two specimens apparently originate from a failed attempt at captive management by Primley Zoo’s founder Herbert Whitley in the 1930s. Unfortunately Whitley’s written records from that era have not survived, if indeed they ever existed. So we have no independent corroboration that this was indeed the case. The discovery of these two specimens demonstrates that value of zoological gardens and breeding centres ensuring that post mortem specimens are deposited in recognised museums so that they can be properly preserved for posterity. It is possible that further specimens of G. thoracatus from the same import may exist in other regional museums in the United Kingdom.